Little Anthony and the Imperials were inducted into the Rock and Roll Hall of Fame in 2009. 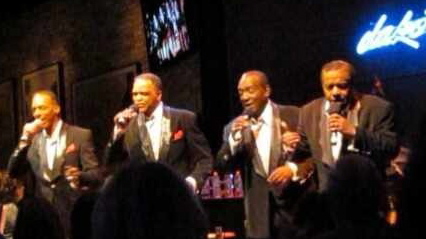 The group (Anthony Gourdine, lead vocals; Clarence Collins, baritone and founder of the group; Ernest Wright, tenor, writer; and Sammy Stain, tenor) were inducted based on their string of hits over twelve years, at least one of which, Goin’ Out of My Head, has become a 20th Century standard. Little Anthony was first in a group called The Duponts, and was recruited by Clarence Collins to be the The Chesters (the original name of The Imperials). The Imperials first gained national attention during the summer of 1958, when Tears On My Pillow took over the airwaves. There wasn’t much air-conditioning then, and you couldn’t walk down a street in the Bronx, where I grew up, without hearing Anthony’s plaintive voice coming off the radio and hi-fis in homes and businesses. The song was a hit throughout the nation, and they appeared on American Bandstand and The Ed Sullivan Show. It was obvious that these Brooklyn-born singers were a few cuts above all the other young singing groups that were one-hit wonders. In fact, Two People In The World, the B-side of Tears, was also a hit. They soon were part of national touring packages and featured performers for the Alan Freed extravaganzas and Murray the K’s Revues at the Brooklyn Paramount and Brooklyn Fox. In 1960 they had a million seller with a nonsensical dance tune called Shimmy Shimmy KoKo Bop, a song Anthony dislikes to this day, but happily sings. 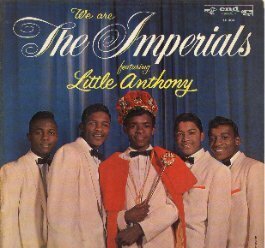 As the sixties came on, many young groups disappeared, but Anthony & the Imperials signed on with Teddy Randazzo and had a string of hits, including Hurt So Bad, On the Outside Looking In and the aforementioned Goin’ Out of My Head. Anthony and the Imperials went their separate ways in the early 70s, only to reunite in 1990 for an oldies show. They had so much fun that they’ve continued performing ever since. Four years ago Stain retired, and was replaced by Robert LeBlanc, a veteran back-up singer for folks such as Marvin Gaye and Aretha Franklin, among others. The four appeared at The Dakota Jazz Club in Minneapolis last June, and asked for an opportunity to come back, which the owner was happy to oblige. Their show is professionally done. In addition to their hits, they performed a Philly-style new song called You’ll Never Know, as well as Kiss, by Prince, Sting’s I’ll Be Watching You, and I Heard It Through the Grapevine. The songs and skits reveal the groups versatility, and it’s obvious that these older gentlemen (Anthony is 70) have found a fountain of youth in performing. He can still hit the high notes, and with some power, though he may not hold them as long as he did 50 years ago. The harmonies (and occasional lead vocals) provided by the Imperials are spot-on. When the opportunity to have an on-air phone interview with Anthony presented itself, Pete Lee, host of Bop Street on KFAI, asked that I do the interview while he handled the engineering. Pete provides a wonderful mix of older music on his show, with special love for vocal group harmony, and I was happy to participate. It was an easy interview. Obviously, with over 50 years of experience, Anthony has done many interviews and has much to say. I’d ask a question and then have to get out of the way. I’ve edited this slightly for clarity. LE: Welcome to Minnesota. We’re pleased to have you back. It was so much fun last time. You and the Imperials seem to have a lot of fun on stage. LE: When you started out, what was it that inspired you to be a singer? AG: I was born to be a singer. That’s a godly gift. I didn’t wake up one day and say I’m going to sing, though people do that. In my case, my mother and my aunts tell me stories that as a little boy – 3 years old – I used to sing all the time. My mother was a gospel singer and my father was a jazz musician, who played alto and tenor sax. My brothers are all talented. And my great grandfather was known as a great singer and my other grandfather was a singer. So it was genes. Genetic. LE: Okay. Were you performing before you got into high school? AG: Absolutely. I was doing off-Broadway shows as a child. Legitimate theater. LE: You and your buddies weren’t getting into trouble? LE: Well sure. You grew up in the Fort Greene neighborhood in Brooklyn, wasn’t it? AG: Yeah, with all the different gangs and stuff, but the one thing that really would give you a pass everywhere you’d go was if you could sing. Nobody would bother you. LE: I suppose it helped attract young women as well. AG: Absolutely, especially in the summertime, when we loved to go to the parks, and sing on the benches at night. It was where all the kids were hanging out. You know, it’s hot, summer; they’re out of school so they stay out at the park late. And they’d look for different groups that may have been in the area to come and sing. It would be like a battle of the groups. You want to see which group gets the most applause, which the people liked the most. LE: You were in The Chesters, and had a little bit of a hit on the East Coast on Apollo Records. AG: Yeah, The Fires Burn No More. In fact, I have to tell the audience that the Chesters were really the Imperials. The record company (End Records) changed our name. AG: Yeah. When we went with Richard Barrett in ’58. They didn’t change my name. As legend goes, Alan Freed, well the record promoters brought in the record Tears On My Pillow, and they played it for him, to get it played on the radio, and he said, “Who’s that girl? Wow that’s really great.” And they said, “That’s not a girl, that’s a guy.” Freed asked “What’s his name.” They told him Anthony Gourdine, so he started saying Little Anthony. LE: I have to admit, that the very first time I heard Tears on My Pillow I was wondering the same thing. Your voice is so high and clear, and so full of heartache it’s no wonder it became such a huge, huge hit for you. AG: You know. Teddy Randazzo was really the highlight of my career. He wrote from his heart, from what he was experiencing in his relationships. He once told me “You’re going to be my voice.” He was really a well-known singer at that time. He used to be with a group called The Chuckles. They were very popular, like The Four Lads. LE: How did you know Teddy? AG: I met him in 1956. I was with a group called The Duponts, and they needed an opening act. It just so happened that the people promoting that show with Alan Freed were our managers. They got us on the show as an opening act and that’s where I met Teddy. He was on the same show. LE: Obviously at that time in New York City, if you wanted a hit, he was the guy to go to. LE: That’s true. He had shows that came out here to the Twin Cities too. AG: He actually started in Cleveland, and he was known then as Moondog, but some cat sued him because he said his name was Moondog. LE: Yeah, a street character who created classical music. 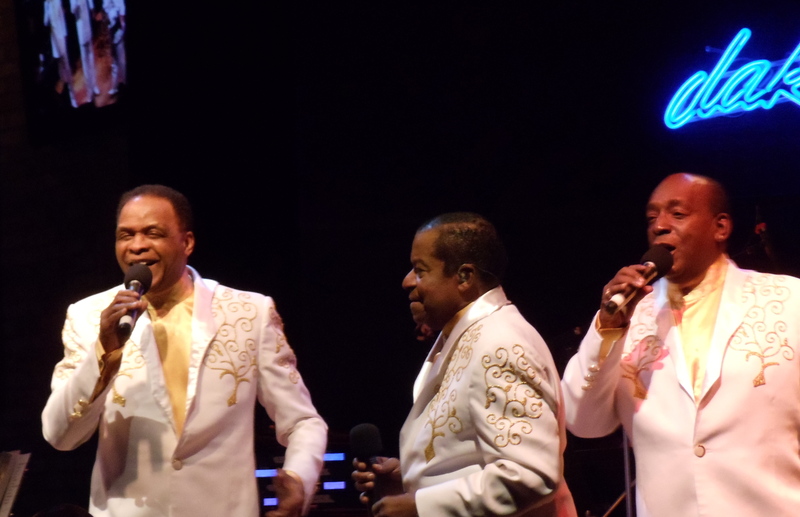 LE: You and the Imperials were one of the few groups that were able to transition between the vocal group harmony of the 50s – what’s become known as doo-wop – and soul music of the 60s. How did you work that out? AG: Let me correct something. I do it a lot, because I was there. Doo-wop. There was no such thing. Nobody knew what doo-wop was called. Doo-wop came from a disc jockey in New York in 1973. He was trying to describe whatever style it was. And really, he was basically talking about groups like The Elegants, The Duprees, groups like Dion and the Belmonts. They were singing a whole different style than the black groups were. We were singing R&B, street corner music. LE: I recall thinking of it as rhythm and blues back in those days. AG: Yeah, it really was rhythm and blues. We didn’t know what a doo-wop was. But what happened, they broad stroked everything, with a broad brush. “We’ll call it Doo-wop.” Because that’s the way they heard it. But really, you’ve got groups like The Flamingos, with I Only Have Eyes for You, that’s doo-wop? The Moonglows with Most of All, and Sincerely. I don’t think so. LE: What I’m trying to figure out. How did you go from the rhythm and blues of the 50s to the rhythm and blues of the 60s, which was beginning to be called soul music? AG: Each Imperial was very talented in and of himself. Clarence (Collins) played piano. He was an organizer, a group guy, knew harmonies, and has perfect pitch. Ernest (Wright) was singing with the Fresh Air Club, one of the biggest choirs in New York. So they had talent. I again, was working off-Broadway shows as a boy. So we didn’t walk in like kids off the street and didn’t know what we were doing. We knew exactly what we were doing. AG: And we were always surrounded by great people. The great Otis Blackwell, who wrote a lot of Elvis Presley’s hits – he was a neighbor. We used to go to his house and work on chords. Then we met other people in our lives that influenced us, plus, when we really got going as Little Anthony and the Imperials, we caught the tail end of the Chitlin’ Circuit, which was the last of vaudeville. So on that show were people like Redd Foxx, Flamingos, Little Willie John, and all these greats. You know what I mean? And you learn from watching them. We really were going to school. I would stand in the wings and watch, and see how they did it, and what they did. They would give us advice, so we were way ahead of that gang that came out at that time. Even the kids then knew we were just a bit different than them, you know? We were starting to sing four-part modern harmony in 1960 – the Hi-Los, the Four Freshmen, and stuff like that. In fact, Otis, of the Temptation, told me, “Man we heard you and had to go back into the shed.” We really weren’t the same as everybody else. Our music was different. Our intonation was different. LE: What I do know is that you’re having a good time on stage. LE: It’s obvious that the three of you have been together for a long time, and you know each other very well, and enjoy each other’s jokes even now. That’s terrific. LE: You mentioned playing Madison Square Garden. Most of the time you’re playing larger halls, so this date is unusual. I know you play Feinstein’s in New York and here at the Dakota so this is an unusual date. AG: Yeah, we got into the Dakota when the owner, Lowell read a New York Times review and said he’d never seen reviews that good, especially from the guy that wrote it, so he was curious. Now, we’re starting to get offers around the country, because to play a jazz club, usually its jazz singers or something close. So it’s an honor. There’s not that many places like the Dakota anymore. Only a few now, when there were so many of them. It’s an honor. It’s also a challenge because we’re used to traveling with 13 pieces. We don’t have the horns, we don’t have that big stuff, and it puts you in a situation of let’s see what you can do now. 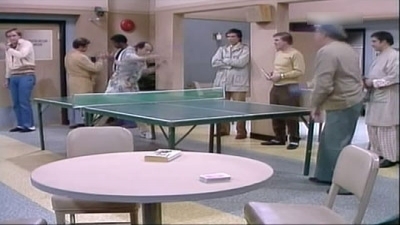 A scene from The Jeffersons episode in which Anthony appeared. Is that him in the background? LE: I’d like to find out more about your acting career, but that can wait until another time. LE: It’s been a pleasure to talk with you. We want to let you prepare for tonight’s show. AG: We had a lot of fun last time. Thanks a lot. This entry was posted on Friday, November 18th, 2011 at 1:21 pm and is filed under Interviews. You can follow any responses to this entry through the RSS 2.0 feed. You can leave a response, or trackback from your own site.